JHS 2014 graduate, Robert Lee Treharne, shows off his Jamestown High School Diploma as his wife, Patricia, looks on. “I am here to confirm that Robert Lee Treharne has satisfied these requirements and is therefore eligible to receive a Jamestown High School Diploma,” said Jamestown High School Principal Mike McElrath. The program allows certain veterans to earn high school diplomas if they left school without graduating. Section 305 of the NYS Education Law created Operation Recognition to recognize the dedication and sacrifice of WW II, Korea, and Viet Nam veterans who left school before graduating by awarding them a high school diploma. A group of Mr. Treharne’s family and friends, a representative from the Navy, Board of Education representatives, JHS Principal Mr. McElrath and JPS Superintendent Tim Mains, all joined in the celebration. Receiving his diploma visibly moved Mr. Treharne. 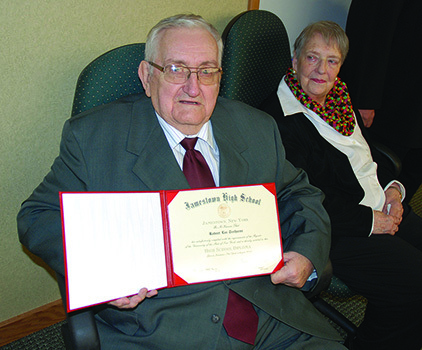 Mr. Treharne dropped out of Jamestown High School in 1950 during his senior year to serve his country as a member of the U.S. Navy as an E-3 Seaman (SN), Stationed on the US Landing Ship Medium Rocket (LSMR 517). He spent his service in the Navy patrolling the Great Lakes and the Caribbean Islands during the war. Once he completed his Navy career, Mr. Treharne moved back to Jamestown and met his wife Patricia. They got married and together raised their family of three boys, John, Robert Jr. and David. Patricia earned a GED in 1974. John attended JHS and then joined the U.S. Marine Corp, where he earned GED in 1984. Robert Jr. graduated from JHS Class of 1977, and joined the U.S. Air Force. David graduated from JHS Class of 1979, and attended JCC, then SUNY Potsdam, Crane School of Music, Bachelor’s Degree in Music Education, The Boston Conservatory, Master’s Degree in Music Performance, SUNY Cortland, Certificate of Advanced Study in Educational Leadership, and SUNY Oswego, Superintendent Development Program and is the Assistant High School Principal and CSE Chair for the Auburn Enlarged City School District. Mr. Treharne worked at local companies including: Plumb Tool, Jamestown Motor Bus Company, Crescent Tool, The Post-Journal and the Charles Bus Company as a school bus driver for Jamestown Public Schools where, prior to retirement in 1992, he was the official driver for the JHS football and basketball teams. His family was also moved by the recognition. For additional information on Operation Recognition, please contact: The NYS Education Department (518) 474-8940 or go to their website at http://www.acces.nysed.gov/aepp/high_school_diploma_veterans.html.